This is a family run three story Georgian Guest House that is home to Pat and Bernie Morris. It is situated in the centre of Clonmel and is close to all amenities. 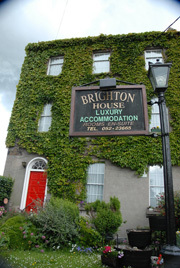 Brighton House is a 3 star guesthouse that can cater for the individual or for families. The house has been decorated to a very high standard and the antique furniture gives it grace and elegance. The rooms are spacious and there is a very welcoming atmosphere. You can relax in the sitting room surrounded by objects of great beauty. There are 5 double bedrooms & 1 single bedroom in total & all bedrooms are ensuite. All of our rooms have direct dial Telephones, Television, free wireless internet, radio, hairdryer and Tea/Coffee making facilities. At the rear of the house there is a private car park.